Featuring “MERCURY“ quiet running, 4-stroke motors (225 hp to 250 hp) providing the power needed	to enjoy your day on the water. Best selection, location & service! We offer “6” different tri-toon models & layouts with luxury interiors that accommodate any size group. Discounts for multiple-day rentals. Tri-toon: A “third” middle pontoon with a flat surface is added to provide a much more stable & smoother ride. Our tri-toons have “27 inch diameter pontoons” which give all boats greater passenger capacity and a smoother ride. All boats legally can carry 16 people or more. 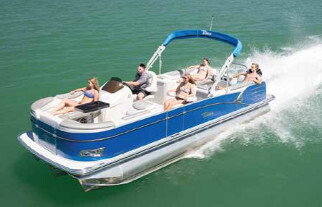 However, we recommend that you choose a boat that best fits the type of group enjoying the lake for the day. Example: All adults or combination adults and children. We also have equipped all the boats with larger motors to insure enough power for a full boat to cruise across the water with ease. A 25 ft. tri-toon with “25 inch tubes” and small motor, loaded with 12-14 adults will set low in the water and move considerably slower. 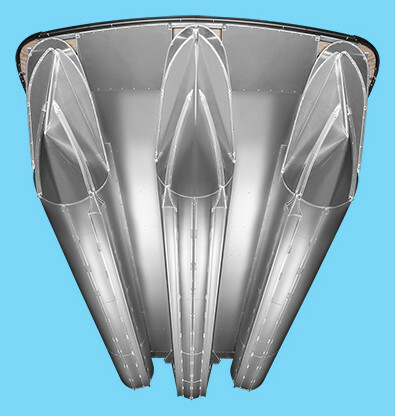 We provide “only” 27 inch diameter tri-toons and larger motors to insure the best customer experience. Enjoy beautiful Torch Lake and adjoining lakes aboard this 2019 Avalon 25 ft. “Premium” designed tri-toon. We upgraded all of our 25 ft. tri-toons with 27 inch pontoons, a Mercury 225 hp, 4-stroke, quiet running motor, raised Commander Helmstand, high performance ‘Bluetooth’ stereo system & deluxe interior package. Although this boat is rated for 16 people we recommend 14 or less for greater room and comfort. New 2019, 27 ft. Avalon "Family Fun"
This is just the boat for your picnic on the water. A "customer favorite" in 2018, so we purchased two new ones with bigger motors and cool new colors. 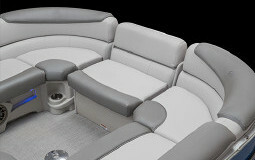 2019 27 ft. Avalon Entertainer with 27 inch pontoons. Equipped with a Mercury 225 hp, 4-stroke, quiet motor with great power for cruising the lakes. This Tri-toon features a built in Booth/Table area, High performance Bluetooth sound system, a raised Commander Helmstand, and deluxe interior seating package. Easily seats 14 to 16 people. This boat looked fun so we purchased one. You will enjoy a relaxing day on the water on this 2019 25 ft. "Premium" designed tri-toon. Upgraded with 27 inch pontoons, a Mercury 225 hp, 4-stroke, quiet running motor, raised Commander Helmstand, high performance 'Bluetooth' stero system & deluxe interior package. Although this boat is rated for 16 people, we recommend smaller groups for this boat (13 or less) for greater room and comfort. 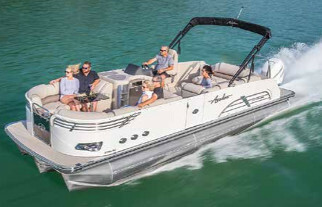 New 2019, 27 ft. Avalon "Family Fun 250"
This is just the boat for your picnic on the water. A "customer favorite" in 2018, so we purchased two new ones with bigger motors and cool new colors. 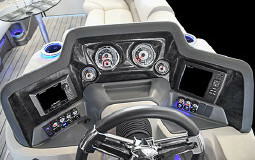 2019 27 ft. Avalon Entertainer with 27 inch pontoons. Equipped with a Deluxe Mercury Verado 250 hp, 4-stroke, quiet motor with great power for cruising the lakes. This Tri-toon features a built in Booth/Table area, High performance Bluetooth sound system, a raised Commander Helmstand, and deluxe interior seating package. Easily seats 14 to 16 people. 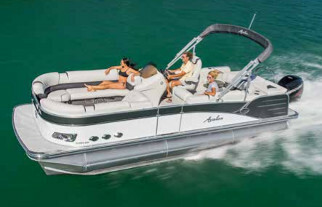 "Bigger is Better" in this 2019 27 ft. Avalon Quad Lounger Tri-toon with 27 inch pontoons. Equipped with a Mercury 225 hp, 4-stroke quiet motor providing ample cruising power for your day on the water. Features a raised Commander Helmstand, high performance Bluetooth sound system & deluxe interior package. We added 27 ft. Tri-toons to our fleet to provide more seating room and a better passenger experience. Easily seats up to 14-16 people. 2018 27 ft. Avalon "Executive" Tri-toon with 27 inch pontoons, the nicest boat available anywhere! 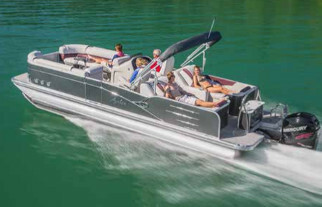 Featuring a Deluxe 250 hp Mercury Verado 4-stroke motor, raised Commander Helmstand, high performance Bluetooth sound system, built-in refrigerated entertainment bar & deluxe interior. Comfortably seats up to 16 people. Enjoy the blue waters of Torch Lake on one of our wave runners! Fuel efficient and plenty of power to ride the waves. Seating for two and multiple rental durations starting from 2 hours to best fit your wave runner experience on the water. We are located next to the Dockside in our new water sports center.